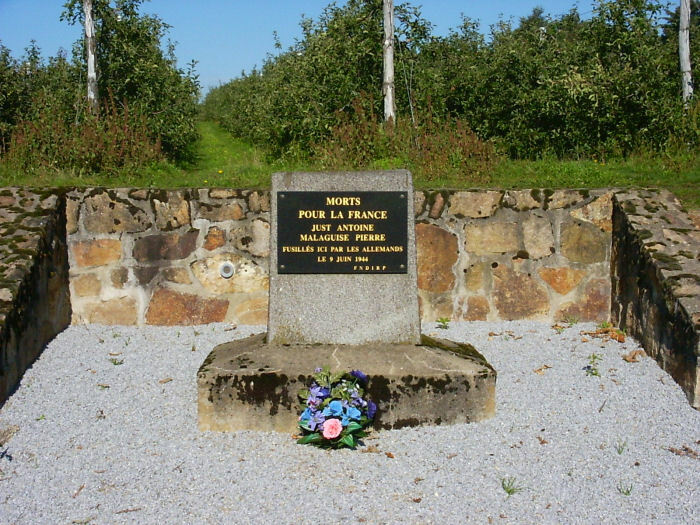 This memorial is on the N141 about 1½ miles east of St. Léonard de Noblat and commemorates two local men who were shot by soldiers from Das Reich during their search for the missing Sturmbannführer Kämpfe. As far as I can tell neither of these unfortunate people had anything at all to do with the kidnapping of Kämpfe. The inscription reads, "Died for France, Antoine Just, Pierre Malaguise. Shot here by the Germans on 9th June 1944". The spot is about a mile west from where Kämpfe was abducted on the same road.